A deliciously tangy fine-cut marmalade made from the finest, gently simmered, sun-ripened Seville oranges. 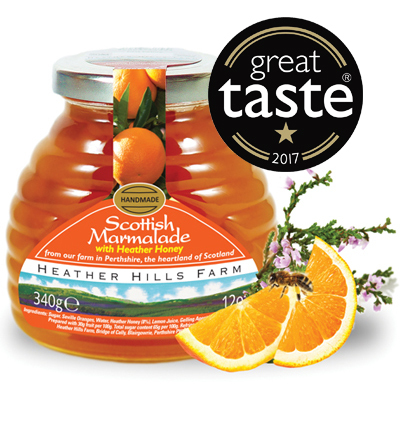 With soft peel and rich amber tones, its fruity nature is delicately married with our very own award-winning Scottish Heather Honey – the taste of Highland sunshine on toast! Pair with soft milky white cheeses such as Goat’s Cheese or Ricotta. The perfect complement to chicken, duck, pork and ham. Ingredients: Sugar, Seville Oranges, Water, Heather Honey (8%), Lemon Juice, Gelling Agent (Fruit Pectin, Dextrose).